A student’s career decision is based on multiple factors. For making an informed decision, the student may typically consult friends, parents or any other well-wisher for guidance and advice. In the age of internet technology, an aspirant has more number of options to seek feedback. He or she can research online for valuable information, join discussion forums, chat on social media with existing students to get real feedback of the college etc. Online platforms usually have strong impact on career decisions of a prospective applicant. Researches have shown that people trust more on online recommendations in the form of customer reviews than any other source. In education marketing, user reviews play a critical role as trustworthy and credible source of information to select a particular course or college. This presents good opportunity for educational institutes to accumulate positive reviews about their brand which can help prospective students to join them. That also means that, in order to grow your academic brand value in today’s competitive market, online is the first marketplace to tap. So, how do you set your own user review mechanism in place that helps to ensure positive feedback about your educational enterprise. In this blog series, we bring to you the simplest ways of amplifying your brand perception using online testimonials. Make sure that you are present on every important online forum related to admissions. Admission seekers should be able to locate your college in important review threads of third party sites while conducting online research about a relevant course offering. Make sure you are regularly monitoring communications coming from your social profiles. Be responsive to appreciate independent reviews given by users on your Facebook page. Encourage your followers to come forward and write positive experiences of your brand. Acknowledge high levels of responsiveness of users by thanking them for sharing positive feedbacks. Regularly monitor incoming messages across the channels to track aspirants’ sentiments. People also leave reviews using Google, which appear in the search results for your college. Use Google My Business where potential students might find you if they are searching for information on your college. There are also industry-specific review sites within your business vertical which are popular among the student community. Make sure your contact information, website, hours, and key offerings are available on these sites too. There will be all sorts of customer reviews on third party sites from happy to not so happy. But once people are there, make sure you have good reviews there too. Provide quick and easy avenues to your audience to write reviews by including links to various ways to share reviews of your institute. You can even ask your audience to share their reviews via email. You may even think of incentivising people to encourage them to write a review — such as an event pass or complimentary entrance into a contest, gift cards, new year’s calendar, diary, pen or anything else. A review request may further help to garner more words of mouth publicity. Make sure you are requesting for students’ reviews at appropriate time of their experience with your brand to get optimal response. For example, a student who has just joined your college will not have gathered enough moments to share with your audience. Let your user spend some time experiencing life in college and classroom. Only then he will be in a position to give a holistic testimonial. Asking for a review at the wrong moment could result in incomplete responses. Ask for reviews during positive moments in a student’s journey. You can also request prominent guests visiting your college to share their wonderful experiences while associating with your academic brand. They can tag your brand in a post on social media for this purpose. Make sure that you use platforms where you want your users to write reviews. For example if you want to capture responses on Facebook then ask your prospects to leave their comments on your Facebook page. Similarly you can send your requests for reviews on WhatsApp or Facebook Messenger so that they land up on platforms where you want them to capture. Sending links of these channels via emails can also be a good idea to integrate cross platforms. Don’t ask for a review directly. You can request for a review by suggesting your prospects to share the moments that they cherished most while in campus. Or any other incident where faculty support has really been instrumental in shaping things the right way for them. Try engaging them in a conversation first and then gauge their comfort level in opening up to give positive feedback. Nothing is perfect in this world and even your target audience knows this. When you get low ratings or an unfavorable comment, try to address it with a genuine concern and maturity without being anxious. This will help to build a proactive brand image in the long run. By presenting logical counter views to negative responses can actually result in improving overall ratings of your college. Treat your reviews as valuable input for improving customer satisfaction. Positive reviews that you receive should be shared with your audience to spread the good word. Highlight high star ratings that people give you through their feedback. On many third party reviews sites and discussion forums such as Quora or Pagalguy, users can mark certain reviews as helpful or can upvote them. This further helps in building positive engagement with your prospects. Make sure to repeat this activity with as many people as you can to re-inforce the success you get by sharing positive feedbacks. Another good way of promoting positive reviews is by way of using them as quotes or testimonials and post them on your social media pages. 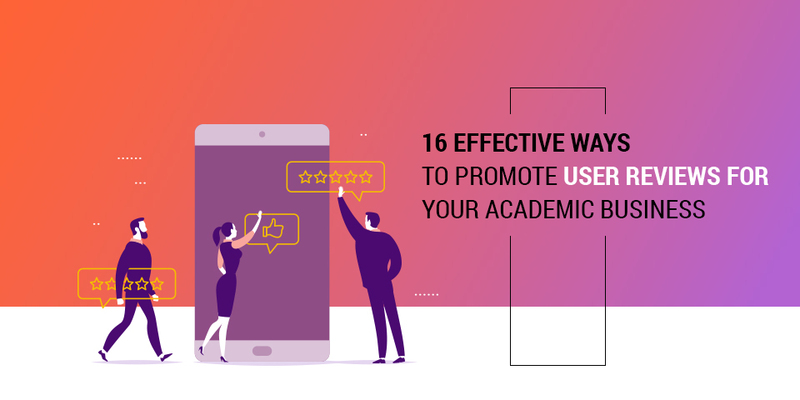 Another good option to generate positive reviews for your academic brand can be by asking for recommendations or endorsements in your LinkedIn network. Similarly influential guests or industry experts can be asked to tweet about their experience while visiting your campus. Such initiatives to increase affirmative sentiments online will go long way in building institutional branding. This strategy will be more effective with people in your network with whom you have built a strong relationship over a period of time. Your college must be organizing a lot of events round the year. Hosting offline events provide great opportunities to ask for reviews in-person. On such occasions, the mood of attendees is generally upbeat. It will really be effective to ask them to leave a positive comment either in the visitors book or on their social media accounts. While posting on social media, request them to tag your college or a few faculty members or even staff to increase outreach of the review. College networking events can provide access to lot of interesting reviews and testimonials by alumni. Reviews can also be collected as part of your event’s feedback survey. You could even create videos of admission aspirants asking them to share their experience of the interview process. And, get them posted on your YouTube channel and other social media pages for cross promotion. Social proof is a powerful marketing tactic. People generally get influenced to buy something when they see others endorsing it. It is normal psychology of customers. Social proof can make your reviews more compelling. It is all about the power of the crowd. So, make sure you have lots of inspiring examples of your stakeholders to share on social media, your website, and at events. Videos or photos are always a better content strategy than text messages. For a few of your reviews, try capturing them in a video format if possible. Through video testimonials you can tell your brand story in a more impactful way across different online channels. You can embed links of these videos wherever you want for generating more engagement. Feature your reviews wherever possible. Validation of your institute by third party websites such as educational portals is one the most effective ways to promote your brand. You can add compelling reviews in your LinkedIn profile or use links of online reviews in your blogs or even promote them through email signature lines. The more places your potential audience can see review results, the better will be your reach and impact. For making your reviews more authentic you can create verification mechanism. Allow people reading them to connect with the reviewer directly (if permitted by the reviewer) to build trust. Although, people generally do not seek further clarifications beyond the testimonial, but just providing them an access can have huge impact on their decision making process. When it comes to career, testimonials are not meant to demonstrate success to prospective students alone. There are other potential audiences as well. These could be parents, mentors or any other person acting as influencer in the decision making process of the applicant. With this in mind, you should classify reviews accordingly to suit the needs of a specific group. Whether your college receives positive or negative responses, it is very crucial how proactive you are to acknowledge them. Although it is not easy to deal with adverse comments sometimes but timely addressing them can minimize its negative impact. Online reviews are a strategic part of your CRM (customer relationship management) support system. It carries lot of weight when it comes to influencing the decision making process of a prospective buyer. If potential aspirants come across an open and transparent user feedback, then they are more likely to form a favorable perception of your educational brand. This will help build positive brand image, and a strong feeling of trust towards your institution. In today’s age of internet technology and smart phones, your potential customer is almost certain to read your reviews online before making his decision. So, online reviews and testimonials are just impossible to ignore. In fact, this type of social proofing is perhaps a new way to promote your academic business.